Russian-registered cargo carrier Sky Gates Airlines, which also has Lithuanian and Azerbaijani interests, is to add another Boeing 747-400F aircraft to its fleet in the second quarter of this year, the carrier’s manager has confirmed to ATO.ru, Russian Aviation Insider’s sister publication. This latest wide-bodied, long-haul freighter addition will be the third of the type in the cargo airline’s fleet. Sky Gates’ fleet currently consists of two 18-year-old Boeing 747-400Fs (tail numbers VP-BCH and VP-BCI) both of which were provided by close partner Azerbaijani cargo carrier Silk Way. 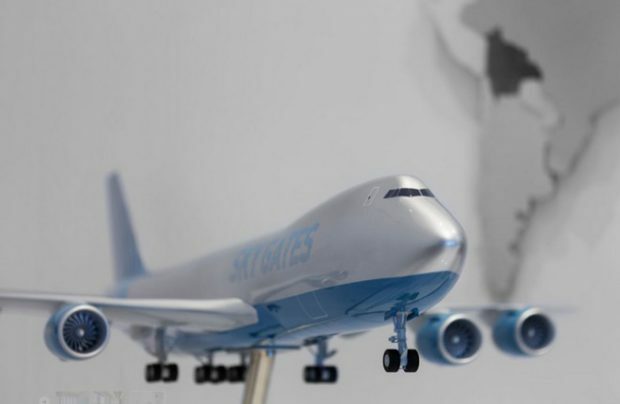 At the beginning of the year, the map of flights of Sky Gates’ air services included such destinations as Baku, Maastricht (Holland), Hong Kong, Dhaka (Bangladesh), Khabarovsk and Novosibirsk. According to the Sky Gates manager, the latest expansion will allow the operator, which is based at Moscow’s Sheremetyevo and Zhukovsky airports, to deploy its fleet more effectively. Although Sky Gates has been offering commercial operations since the autumn of 2016, a surprising development is that the airline’s operational and financial results were not included in the 2017 annual statistics published by Russian aviation authority Rosaviatsiya. Observers wonder why an airline – with two such powerful freighters – has not been included in the list of 35 leading cargo airlines of Russia. Nevertheless, Sky Gates is developing its fleet in a growing market. Last year, Russian airlines collectively carried 15.7 per cent more cargo and mail shipments than in 2016. In January of this year, the total tonnage grew by 8.6 per cent on January 2017.